Starting with a massive front porch covered with a metal roof, a prominent gable with a Palladian window and decorative bracket, and two bay windows with French doors, this home evokes a rugged sophistication. 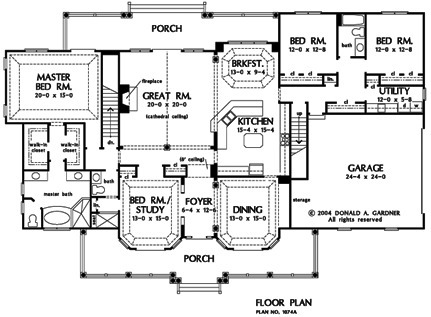 Inside, positioning and architectural features give room definition, while keeping an open floorplan. Tray ceilings top the versatile study/bedroom, master bedroom, dining room and breakfast nook, while an angled counter separates the kitchen from the great room and breakfast nook. A vaulted ceiling caps the great room, expanding visual space. The common rooms divide the master suite from the secondary bedrooms, promoting peace and quiet. Two large walk-in closets provide plenty of storage space, while the well-equipped master bath includes twin vanities, a private privy, garden tub and spacious shower. 1st Floor: 2934 Sq. Ft. 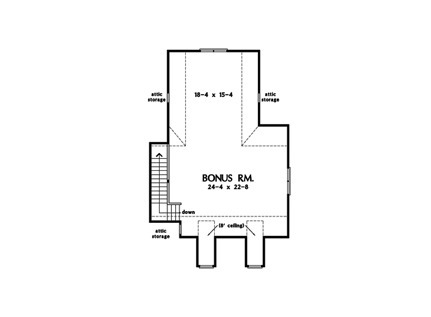 Bonus Room: 975 Sq. 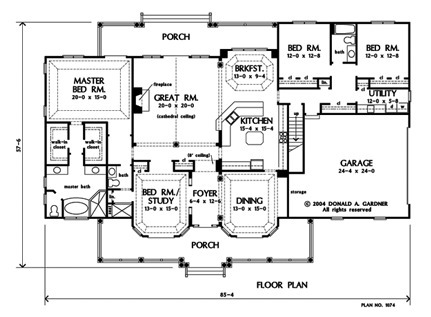 Ft.
House Dimensions: 85' 4" x 57' 8"
Great Room: 20' 0" x 20' 0"
Master Bedroom: 20' 0" x 15' 0"
Porch - Rear : 28' 8" x 8' 0" x 9' 0"
Great Room (Cathedral): 20' 0" x 20' 0" x 19' 0"
Foyer : 6' 4" x 12' 6" x 9' 0"
Dining Room (Tray): 13' 0" x 15' 0" x 10' 6"
Kitchen : 15' 4" x 15' 4" x 9' 0"
Breakfast Room (Tray): 13' 0" x 9' 4" x 10' 6"
Utility Room : 12' 0" x 5' 8" x 9' 0"
Bonus Room : 24' 4" x 22' 8" x 9' 0"
Garage Storage : 3' 8" x 10' 2" x 0' 0"
Master Bedroom (Tray): 20' 0" x 15' 0" x 11' 0"
Bedroom / Study (Tray): 13' 0" x 15' 0" x 10' 6"
Bedroom #3 : 12' 0" x 12' 8" x 9' 0"
Bedroom #4 : 12' 0" x 12' 8" x 9' 0"
Porch - Front : 50' 4" x 6' 0" x 10' 4"